The phrase refers to a battle fought by Muhammad and his army against a tribe of Arabian Jews, (in which the tribe was largely exterminated) and is now used to threaten modern Jews with a similar fate. Chants led by staff members of CAIR's frequent event partners—American Muslims for Palestine and Al Awda: Palestinian Right of Return Coalition—included hysterically screeched renditions of "With spirit and blood, we'll redeem Al Aqsa!" and "Intifada, Intifada, long live the Intifada!" As we found this behavior to be somewhat less than charming, we thought it would be only fitting that CAIR, which identifies itself as a "leading advocate for justice and mutual understanding," issue comment on protestors calling specifically for violence against Jews. So, when CAIR-NY did not return either request for comment, we contacted Ibrahim Hooper, (CAIR-national's National Communications Director and spokesman) and sent him video footage of the rally. Much to our surprise, Mr. Hooper replied by condemning the chants unequivocally. "CAIR has a long history of challenging anti-Semitism in all its forms. We believe that such statements are inappropriate and should be condemned," he wrote. While we welcome Mr. Hooper and CAIR-National's condemnation of Islamist anti-Jewish bigotry, we can't help but contrast Mr. Hooper's statement with an examination of CAIR's past sanctions of anti-Semitism and those who peddle it. Indeed, in a special report, the Anti-Defamation League once concluded that CAIR has long expressed anti-Semitic and pro-terror rhetoric, adding that, "[CAIR's] public statements cast Jews and Israelis as corrupt agents who control both foreign and domestic U.S. policy and are responsible for the persecution of Muslims in the U.S."
In fact, CAIR Executive Director, Nihad Awad, has reportedly claimed that US policy is "driven in part by the Jewish origin of many Clinton administration officials. ...Who is opposing the latest agreement with Iraq? Look at their names. Look at their ethnic, their ethnic or religious or racial background. You will see that these are the same groups that belong to the same interest groups in the Administration..."
CAIR-Chicago's director, Ahmed Rehab, once published an essay defending notorious Holocaust-denier David Irving, and decrying American media for condemning books that "disagree with the established opinions of the able Jewish historians regarding the details of the holocaust [sic]." Rebab even asserted that talk-show host Charlie Rose "confirmed the Jewish control over the media" by criticizing Irving on television. Several times, CAIR has hosted another neo-Nazi—William Baker—at its events. On one occasion, CAIR's publicity advertised him as a "renown Christian scholar." And, at an conference at Brooklyn College organized by the Islamic Association for Palestine (now defunct and designated by the U.S. government as helping fund Hamas) and co-sponsored by CAIR, invited speaker Wagdy Ghoneim led the audience in chanting "No to the Jews, descendants of the apes." Though we appreciate Mr. Hooper's censure of the protestors' sentiments, it is clear that CAIR does not condemn anti-Semitism "in all its forms." Rather, CAIR endorses speakers, events, and groups that promote it. 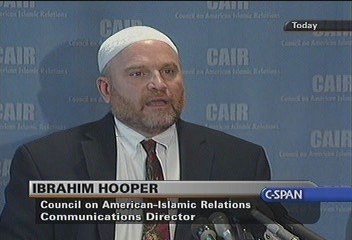 If Mr. Hooper's words are ever to ring true, CAIR will have to clean up its act.